Liquid Ship does not offer any booking services that we know. You can always contact them to check. Liquid Ship sits at the St George's Cross end of Great Western Road. A no-nonsense bar and restaurant that is always stylish in its own cool way. Sample unusual tapas all day, or go for one of the huge and sometimes odd Liquid Ship 'filled pieces' (sandwiches). Hearty helpings of meat and veggie pizza, a great selection of sandwiches - chicken polka, squidgy veggy, Andalucian - come your way here. Or you might prefer beef chilli tacos, or the Liquid Ship 'Mafioso Dog' which involves a giant sausage! Whatever you decide, you'll have a great time in this energetic cafe bar. Live music keeps Liquid Ship buzzing on certain nights, and the window tables are perfect for people watching. Great news! Finding this page means you can now join our VIP list for Liquid Ship. 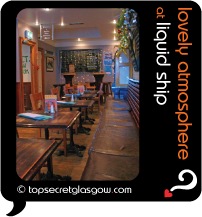 Grab your very own web page all about Liquid Ship. Do you have a special story about Liquid Ship? A funny experience? A grand occasion? A funky photo? A personal tip? A top secret?